With some NFL sets, the thought behind it might not be immediately clear based on the name, but that's not the case for 2017 Panini Plates & Patches Football. Naturally centered on premium memorabilia cards and printing plates, each box totals five cards with one autograph, relic and plate. If you enjoyed the 2016 product, you are in luck as the format is identical and the designs are very similar. 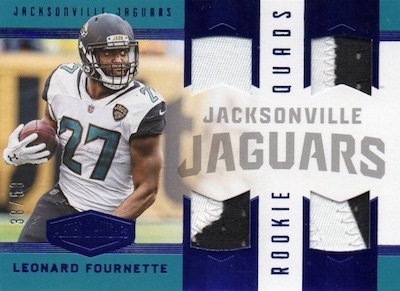 Split into three subsets, the main part of the 2017 Panini Plates & Patches Football checklist includes current players in the base, top 2017 rookie names, and a Legends grouping for retired stars. One of these cards comes in every box as does a parallel limited to 50 copies or less. 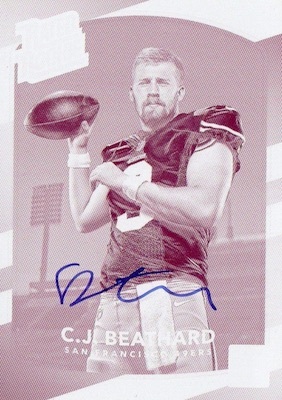 Of course, each hobby box also promises a Printing Plate, which normally comes from a variety of other sets. 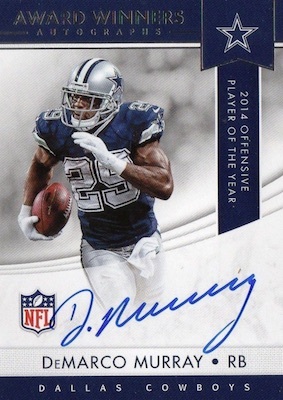 Autographed Printing Plate cards are a case hit. With only five total cards per box, the 2017 Panini Plates & Patches Football hits are even more important. 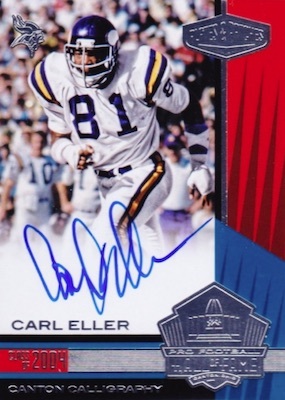 Signed cards can be from the Rookie Patch Autograph line, now with a larger memorabilia area, or the Plates & Patches Autograph set, which has two prime relics on each card and a print run of 25 or less. 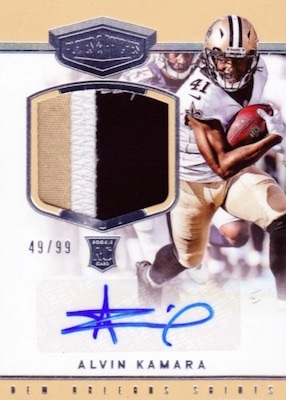 The RPA cards also have a one-of-one Shield parallel. 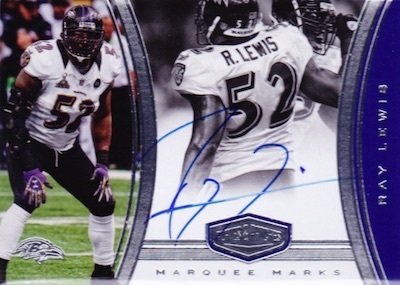 In addition, the hard-signed Canton Calligraphy and Marquee Marks (#/50 or less) provide some of the biggest NFL names. 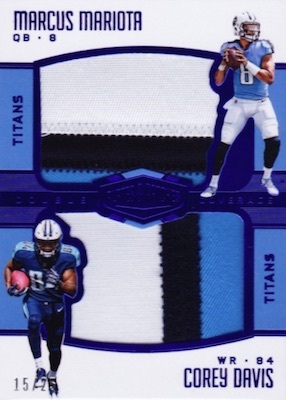 As far as the "Patches" part of the name, 2017 Panini Plates & Patches Football includes the jumbo Full Coverage relics for top rookies. These also come in Red parallels, numbered to five copies, that feature a brand logo or laundry tag, or as a one-of-one Gold shield. 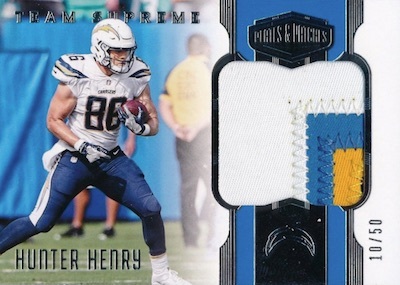 Double Coverage keeps the large patch but increases the fun with two young hobby standouts. 2018 PANINI HONORS 2017 PLATES & PATCHES LARRY ALLEN HALL OF FAME RED AUTO # 5 ! 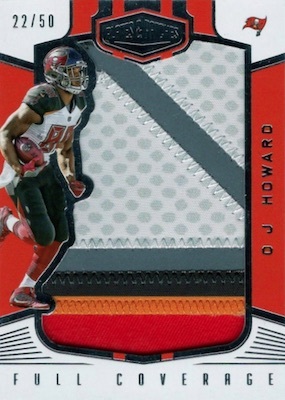 View 2017 Plates and Patches NFL card listings on eBay. Base - #/99, Legends - #/75, Rookies - #/75. PARALLEL CARDS: Blue #/50, Green #/25, Red #/10, Gold 1/1. PARALLEL CARDS: Blue #/50 or #/25, Green #/25 or #/10, Red #/10 or #/5, Gold 1/1. View the spreadsheet for specific parallel print runs. Not listed on final checklist. 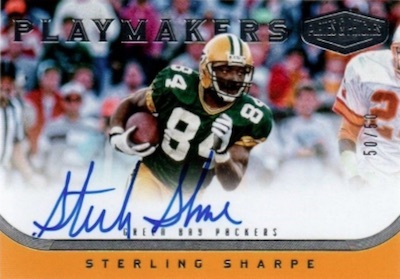 PARALLEL CARDS: Blue #/49 or less (No Doleman*), Green #/25 or less, Red #/10 or less (No Montana*), Gold 1/1. PARALLEL CARDS: Blue #/25, Green #/10, Red #/5, Gold 1/1. PARALLEL CARDS: Blue #/25 or less, Green #/10 or #/5, Red #/5 or #/3, Gold 1/1. PARALLEL CARDS: Green #/10 or less, Red #/5 or less, Gold 1/1. 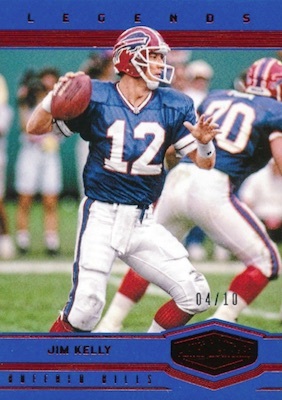 PARALLEL CARDS: Blue #/25 or less (No Kelley*), Green #/10 or #/5, Red #/5 or #/3, Gold 1/1. PARALLEL CARDS: Blue #/50 or less (No Collins*), Green #/25 or less, Red #/10 or less, Gold 1/1. PARALLEL CARDS: Blue #/50, Green #/10, Red #/5, Gold 1/1. Likely includes most/all names from Quads set above. PARALLEL CARDS: Blue #/10 or #/5, Green #/5 or #/3, Red #/3 or #/2, Gold 1/1. PARALLEL CARDS: Blue #/50 or less, Green #/25 or less, Red #/10 or less, Gold 1/1. 339 cards. 4 one-of-one versions for each. Plates come from other products. View the 2017 Panini Plates & Patches Football checklist spreadsheet. I pulled the 1/1 Evan Engram Full Coverage NFL Shield last night. Great Product. Panini finally did it. They got it right with this product. A low end hobby box with major high end hits that everyone can enjoy. Have bought 6 boxes from a break page and along with everyone else the hits have been coming and coming. I’d say it’s almost impossible to lose money on a box. I hope next Contenders Optic keeps up to this. Super-cool product! I have the Trubisky/Howard Double Coverage shield card. Card is absolutely beautiful! Possibly my favorite of all within my collection. 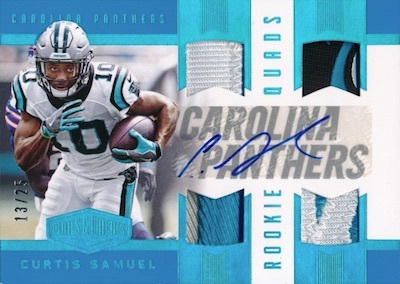 Great Product – Purchased a few hobby boxes for my son. We pulled 2 autograph plates, Matt Ryan autograph and a Terrell Davis Redemption card. Finally found a product where the autographs are known. 2017 Panini Plates and Patches Football Hobby Box - Factory Sealed!